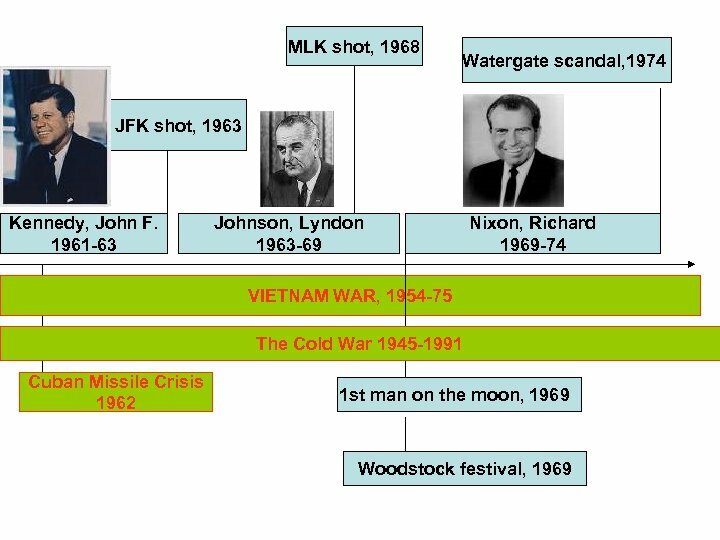 22 nd of November, 1963 – US president, John F Kennedy shot and killed in Dallas. 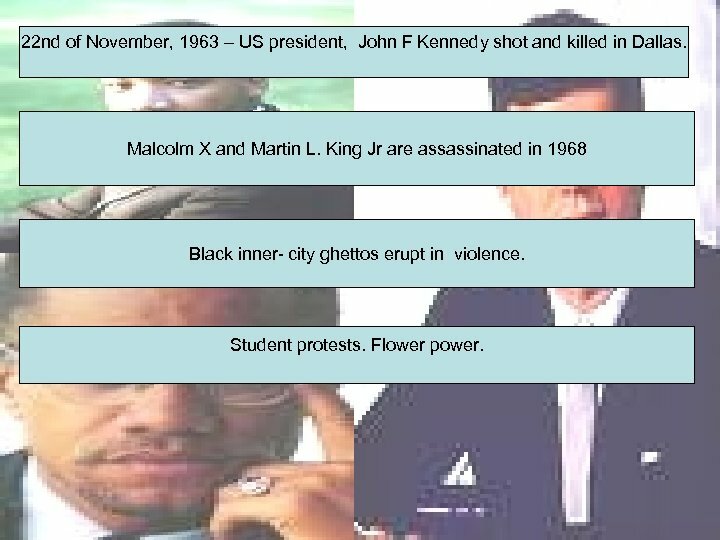 Malcolm X and Martin L. King Jr are assassinated in 1968 Black inner- city ghettos erupt in violence. 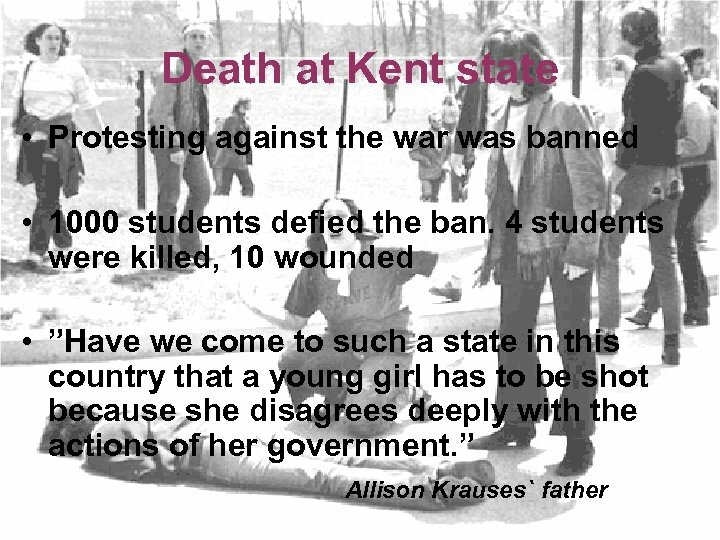 Student protests. Flower power. 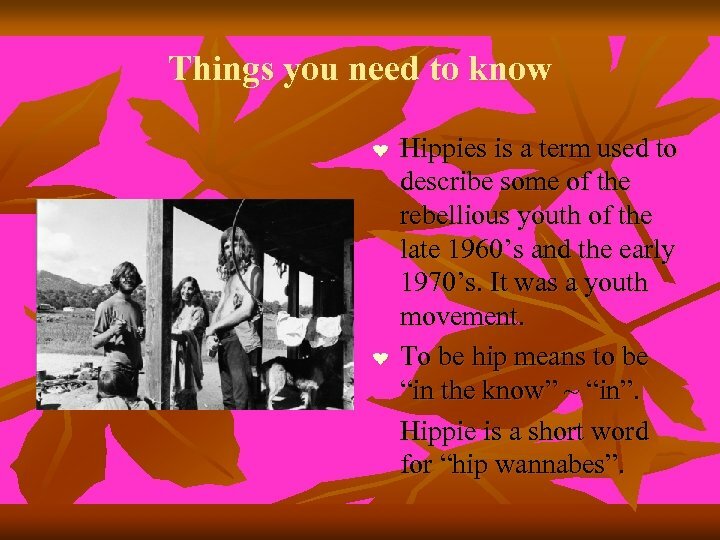 Things you need to know ❤ ❤ Hippies is a term used to describe some of the rebellious youth of the late 1960’s and the early 1970’s. It was a youth movement. To be hip means to be “in the know” ~ “in”. 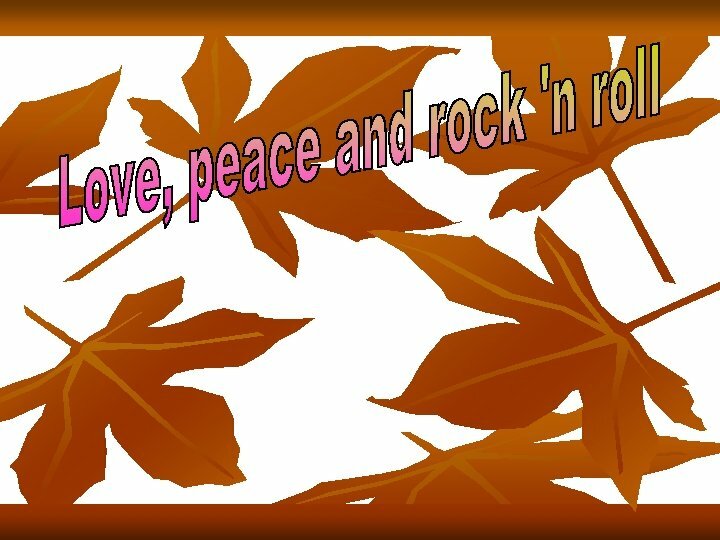 Hippie is a short word for “hip wannabes”. 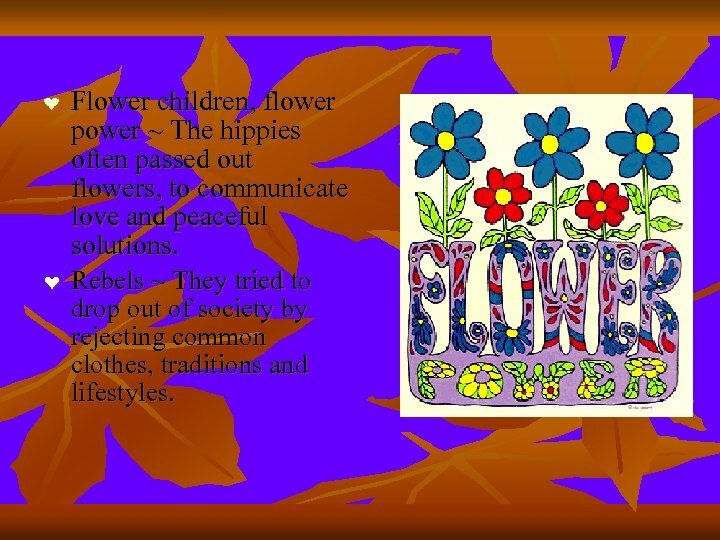 ❤ ❤ Flower children, flower power ~ The hippies often passed out flowers, to communicate love and peaceful solutions. 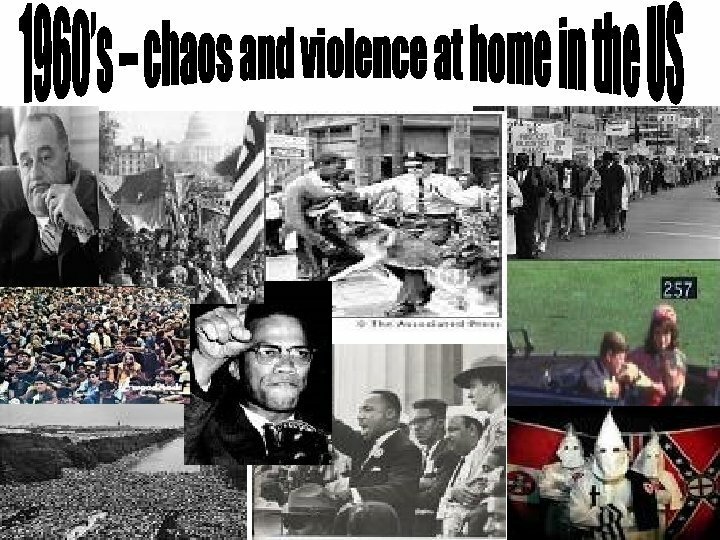 Rebels ~ They tried to drop out of society by rejecting common clothes, traditions and lifestyles. 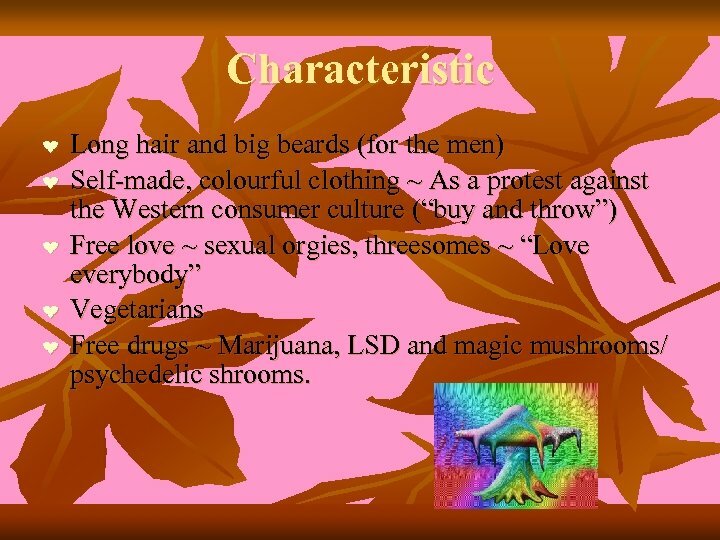 Characteristic ❤ ❤ ❤ Long hair and big beards (for the men) Self-made, colourful clothing ~ As a protest against the Western consumer culture (“buy and throw”) Free love ~ sexual orgies, threesomes ~ “Love everybody” Vegetarians Free drugs ~ Marijuana, LSD and magic mushrooms/ psychedelic shrooms. 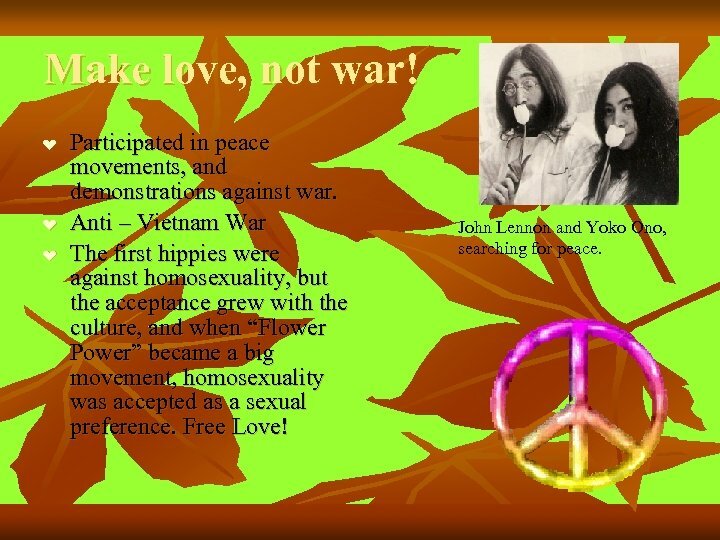 Make love, not war! 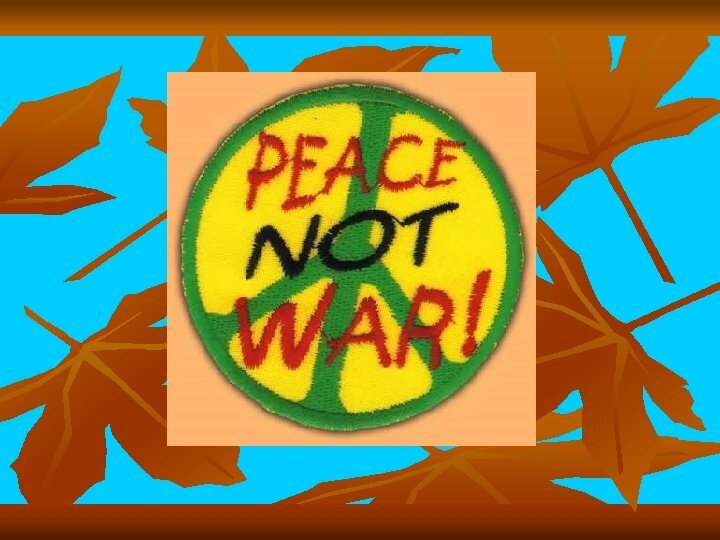 ❤ ❤ ❤ Participated in peace movements, and demonstrations against war. 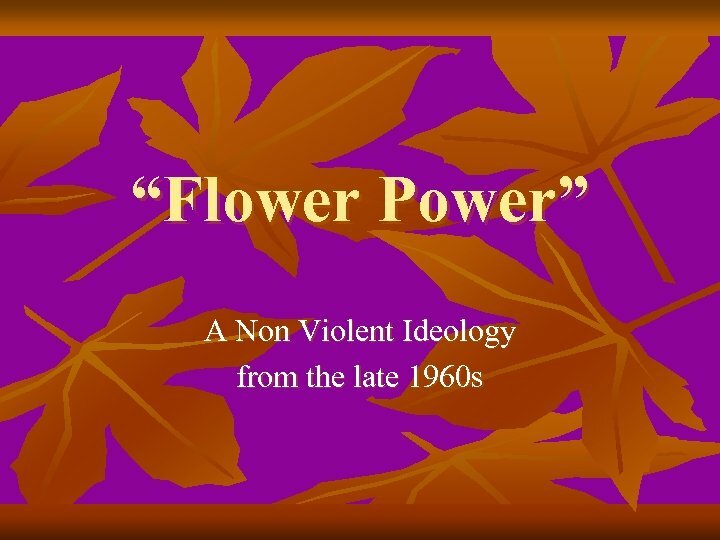 Anti – Vietnam War The first hippies were against homosexuality, but the acceptance grew with the culture, and when “Flower Power” became a big movement, homosexuality was accepted as a sexual preference. Free Love! John Lennon and Yoko Ono, searching for peace. 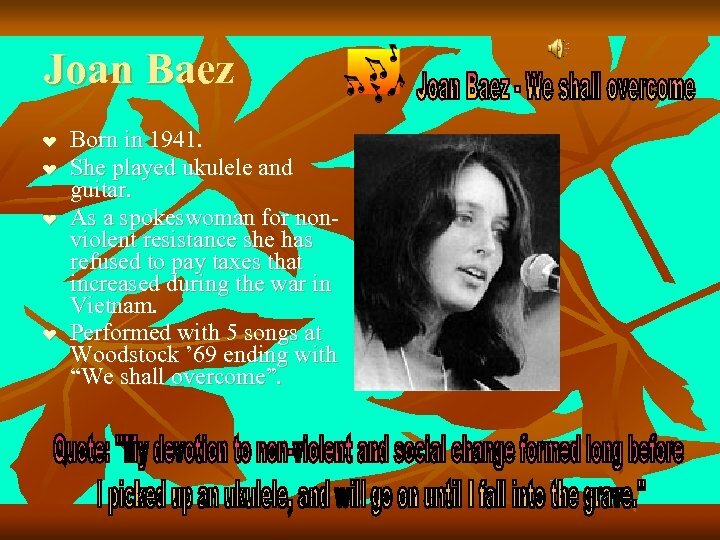 Joan Baez ❤ ❤ Born in 1941. She played ukulele and guitar. As a spokeswoman for nonviolent resistance she has refused to pay taxes that increased during the war in Vietnam. 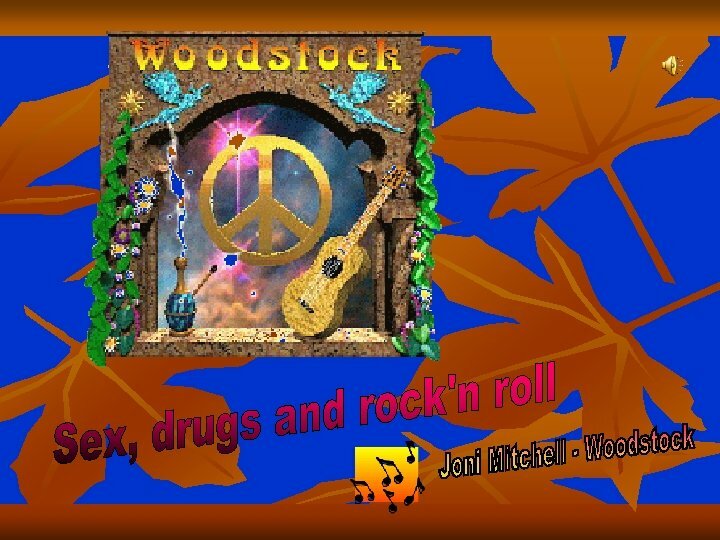 Performed with 5 songs at Woodstock ’ 69 ending with “We shall overcome”. 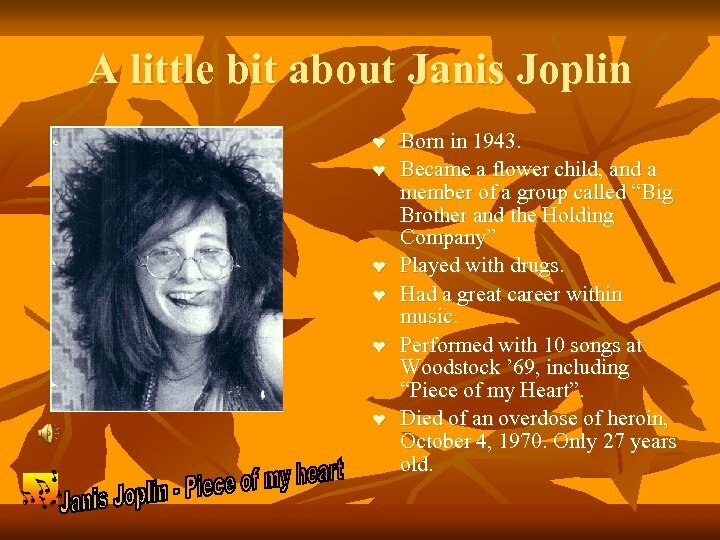 A little bit about Janis Joplin ❤ ❤ ❤ Born in 1943. Became a flower child, and a member of a group called “Big Brother and the Holding Company” Played with drugs. Had a great career within music. 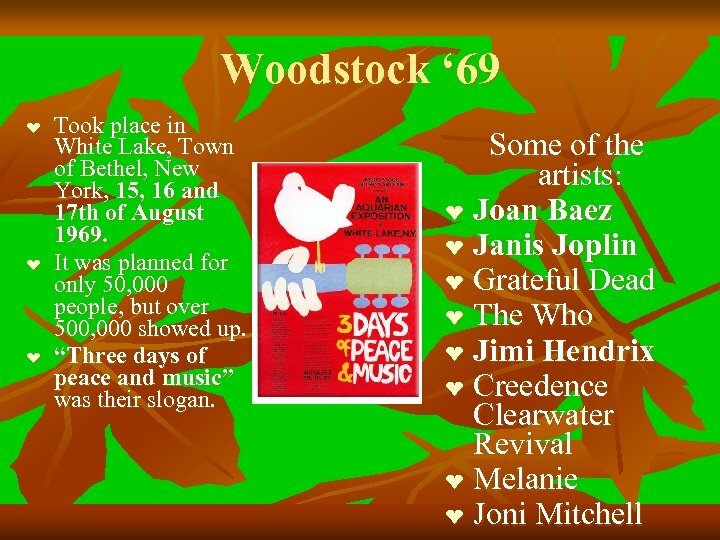 Performed with 10 songs at Woodstock ’ 69, including “Piece of my Heart”. Died of an overdose of heroin, October 4, 1970. Only 27 years old. 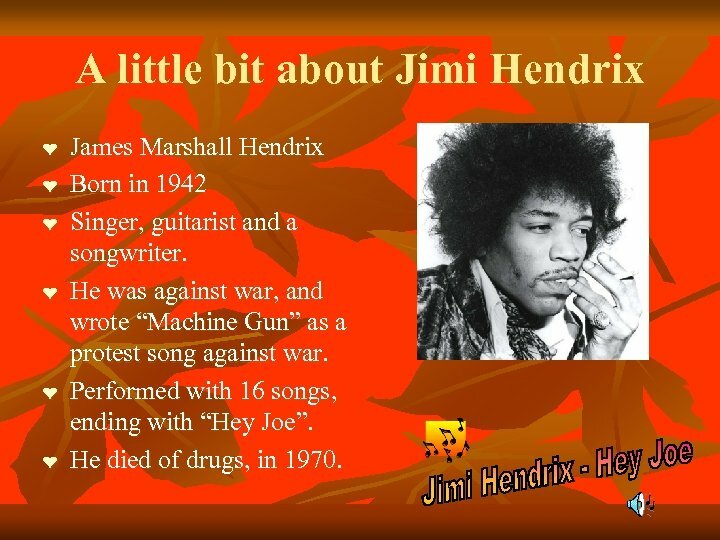 A little bit about Jimi Hendrix ❤ ❤ ❤ James Marshall Hendrix Born in 1942 Singer, guitarist and a songwriter. 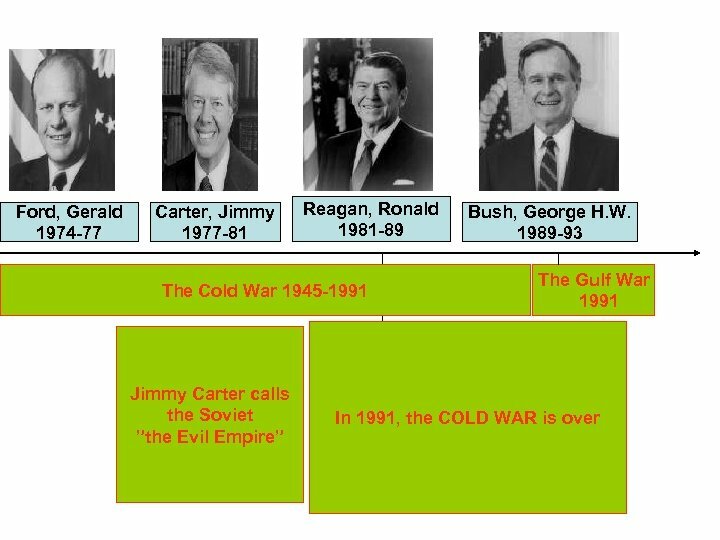 He was against war, and wrote “Machine Gun” as a protest song against war. Performed with 16 songs, ending with “Hey Joe”. He died of drugs, in 1970. 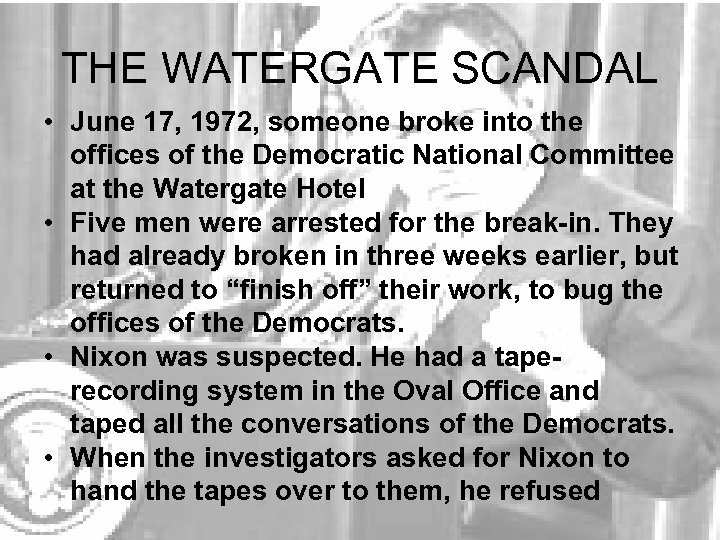 • This case was taken to the Supreme court, and Nixon again refused to give the judges the tapes that recorded all verbal action in his office. 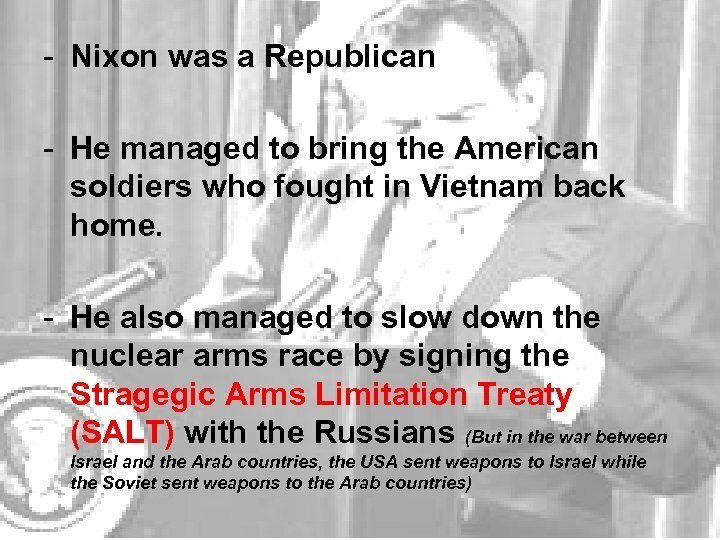 • It became more and more clear to the United States that Nixon was hiding the fact that his men had broken into the building to try and sabotage George Mc. Govern and the Democrats in the 1972 election. 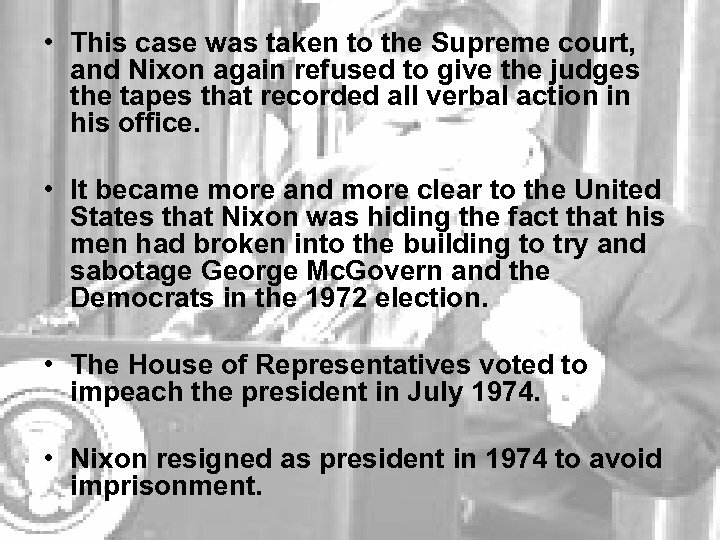 • The House of Representatives voted to impeach the president in July 1974. 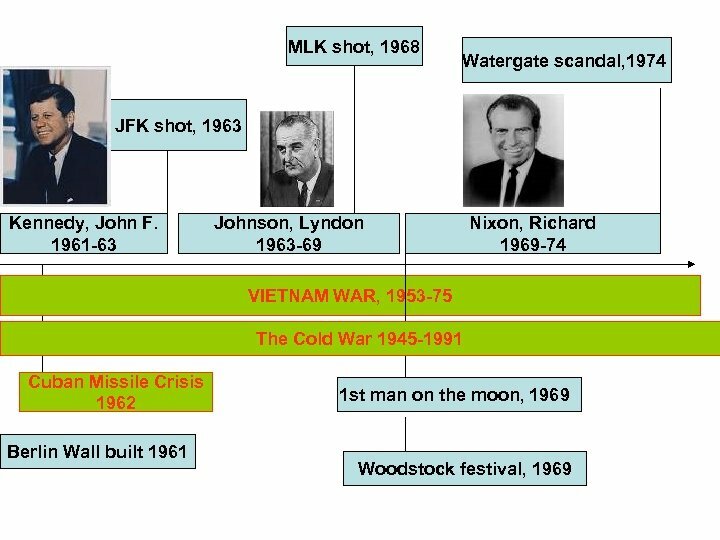 • Nixon resigned as president in 1974 to avoid imprisonment.